Maybe on my first trip to South India, or at at Sri Lankan restaurant in Berlin. But I do know that I had it dozens of times in the ten weeks of backpacking and travel in Sri Lanka. Unlike many dishes, it didn’t vary much from place to place, family to family. Traditionally, Pol Sanbol is often made with dried fish, such as Maldive fish flakes – quite common Sri Lanka. Obviously for a vegan version, I skip that. I make Pol Sambol pretty much every time I make Dal Curry, and other Sri Lanka “Rice and Curry” dishes. 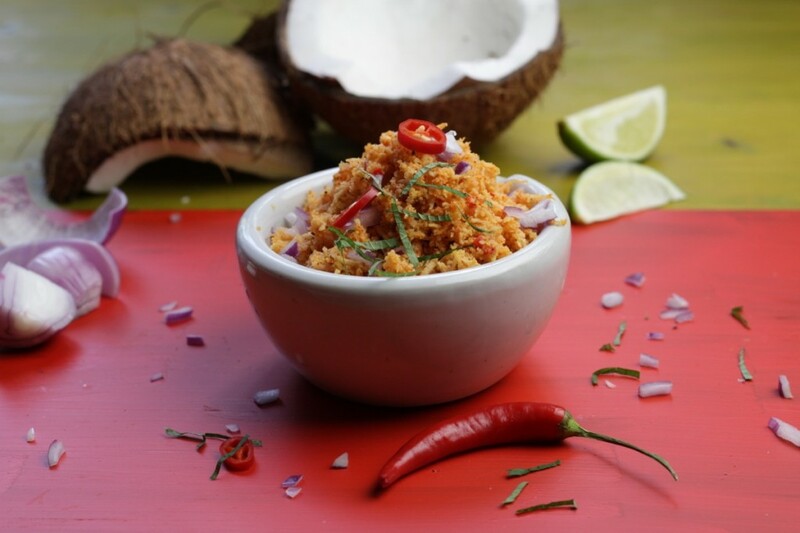 But it’s also essential for Hoppers (Idiyappam) – which means this spicy coconut topping is enjoyed any time, with any Sri Lankan meal, whether breakfast, lunch, dinner… or just for a snack! If using dried grated coconut, first mix well with water and soak 20 min. In a mortar and pestle, grind and pound onion and garlic to a coarse paste. Alternately, mix well in bowl. Add grated coconut, black pepper, chili powder, paprika, and sugar. Mix well. Add lime juice and salt, adding more as desired to taste. Garnish with finely chopped red or green chili. Serve with Dal Curry, Hoppers, bread, or snacks. Extra Heat: Add 1/2–1 tsp red chili flakes along with other spices. This entry was posted in South Indian, Sri Lankan and tagged coconut, pol symbol, south indian, spicy, sri lankan. Bookmark the permalink. So glad you’re back to blogging!! Now I need to catch up. That dish looks and sounds amazing!!! Hi Bianca, yeah, it was way too long! I have so much great content and just needed to make it a priority and find the time again! I hope you like it!